Growing ornamental plants for sale really only emerged as a trade separate from other forms of commercial gardening towards the end of the 17th. A few of these early nurserymen issued catalogues, but the whole trade moved to a different level in the early 18thc when Robert Furber appeared on the scene. Born in 1674 he was only in his 20s when he established his nursery business in Kensington near Hyde Park Gate and Kensington Gore. Despite this precociousness he would probably only have been a footnote in the history of gardening if it hadn’t been for the plant catalogues he issued later in life. Amongst the leading plant collectors in the country at this time was Henry Compton, the Bishop of London, who effectively turned the grounds of Fulham Palace into a private botanic garden, full of newly imported exotic plants sent to him from all round the world,but particularly North America. When Compton died in 1713 his successor sold some of the ‘moveable stock’ in the garden and Furber, along with Christopher Gray, a Fulham nurseryman, was one of the principal buyers. 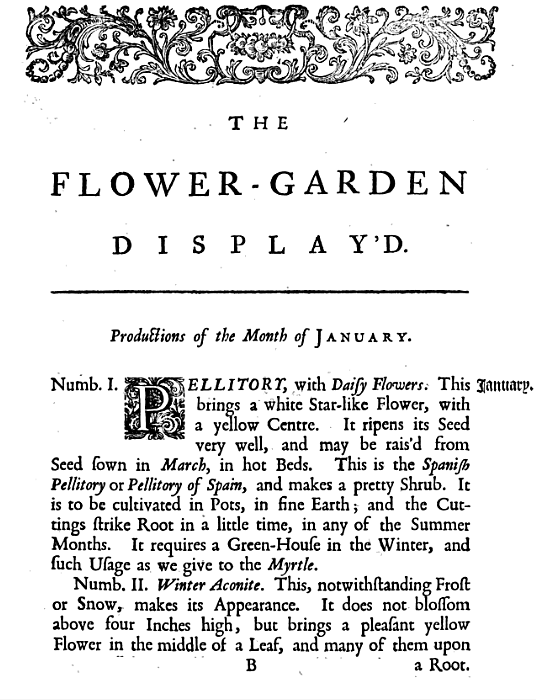 They then used their purchases to propagate material for sale and their stock was extensive enough by 1724 for Philip Miller to include it in his Gardeners and Florists Dictionary. A few years earlier [c 1720] Furber had also begun self-publicizing. He published an engraving of a tulip tree, [Liriodendron tulipifera] a magnolia [Magnolia virginiana] which was then believed to another species of tulip tree, and a silk-cotton tree, [Bombax ceiba]. They were all taken from the garden at Wilton House, presumably supplied to the Earl of Pembroke, from material taken from Compton’s collection at Fulham Palace.He certainly boasted later in one of his catalogues that he had managed to propagate the tulip tree , ‘notwithstanding some Writers have thought it difficult’. 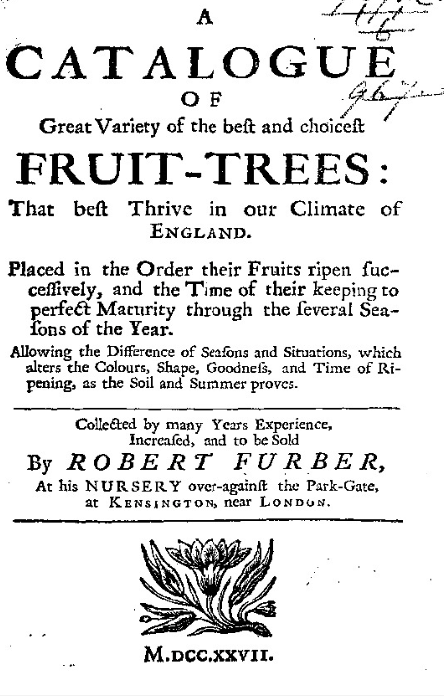 In 1727 Furber produced two catalogues of his nursery stock. 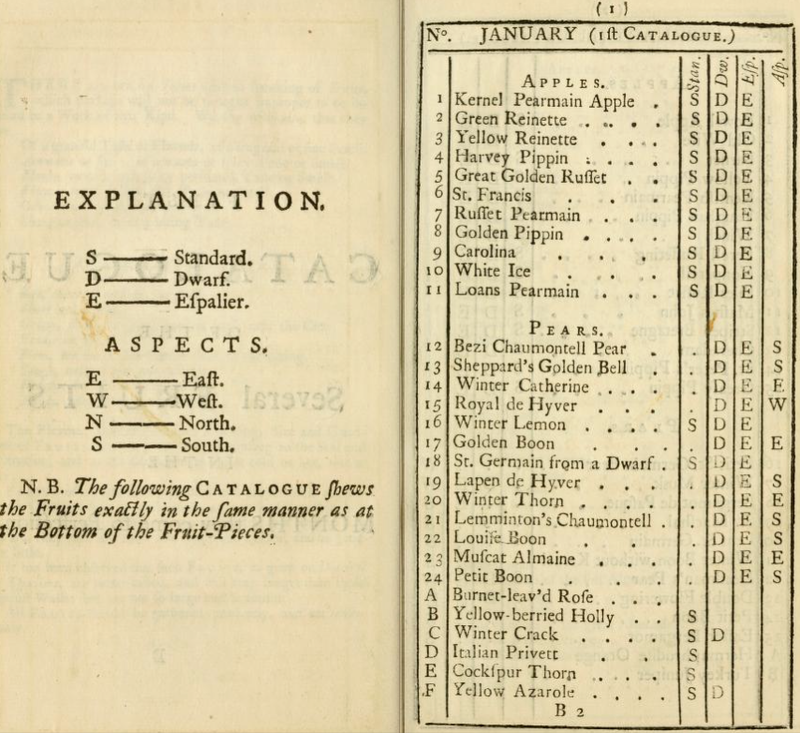 The first was a 41 page listing of English and foreign trees that he had available, and the second a 16 page list of his holding of ‘the Best and Choicest Fruit Trees’. Now, with the best will in the world, it must have been difficult to get enthusiastic about the possibility of buying some new or rare based on the nothing more than a name on a long list. How could a buyer differentiate between Mitcham Monster, Old-Wife Apple, Margaret Apple or Golden Monday or indeed any of the others of the 79 apple varieties he claimed to have for sale. That was something that Furber must have recognized. When the Society of Gardeners was set up in 1730 he must have been an obvious candidate for membership, and his stock appeared in the first part of its Catalogus Plantarum overseen by Philip Miller in 1730. Incidentally Furber’s son William was apprenticed to Miller at Chelsea. So far though Furber’s achievements were much like other 18thc nurserymen and he would not have secured more than a footnote in the history of gardening. However, he was ambitious enough to go on and take the risk of having had his catalogues produced in a novel format: complete with high quality illustrations. 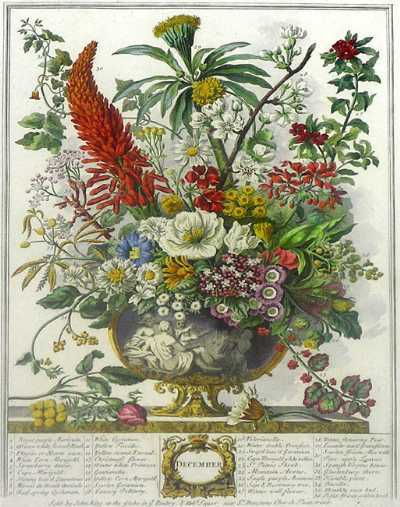 The depiction of flowers and plants was traditionally associated with book form. Woodcuts and, later, engravings served as illustrations to text. 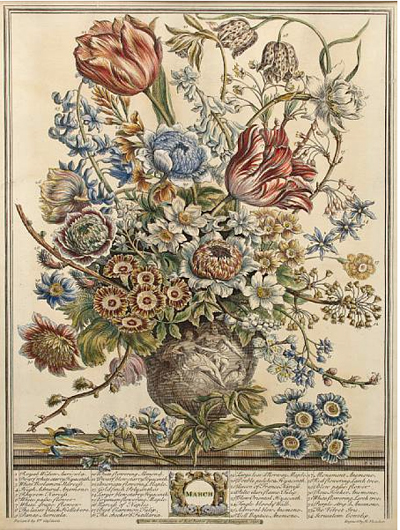 In 17thc France and Holland artists began to develop the ‘free-standing’ botanical or flower print: a work of art in its own right. 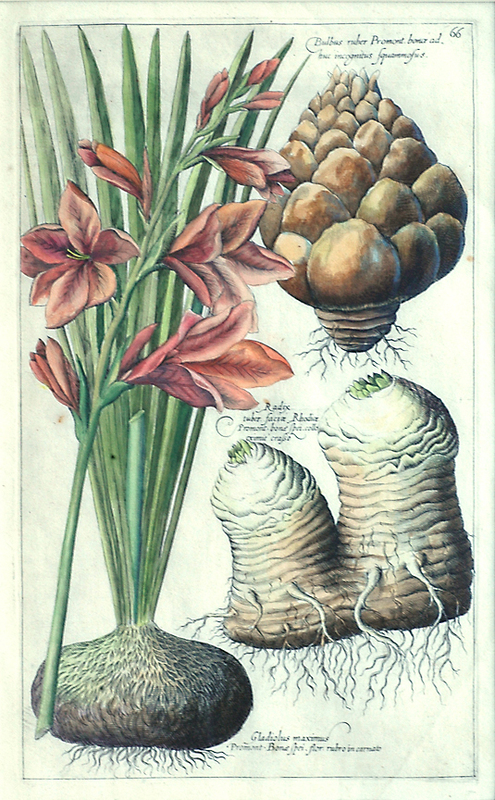 One excellent example of this is Emmanuel Sweert’s catalogue of plants, published as Florilegium between 1612-14. 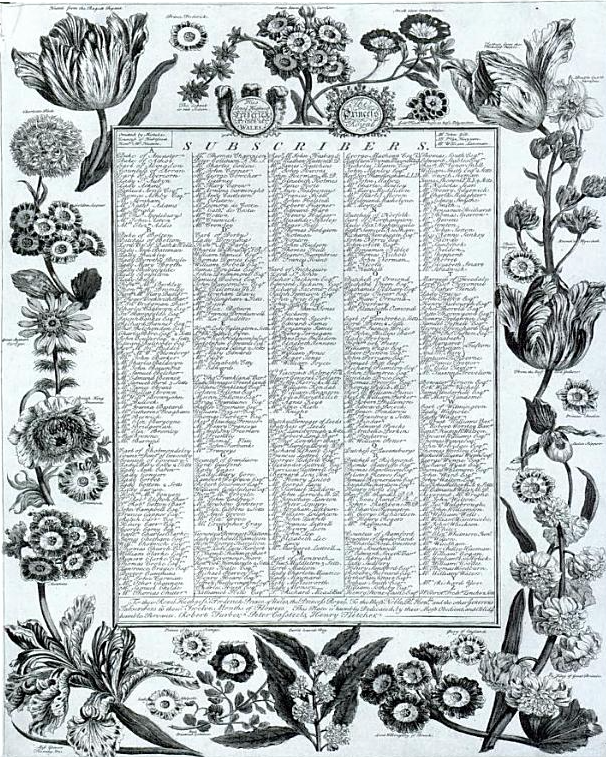 Although it contained a list of plants that Sweerts had available the plates were decorative in their own right, and were based not on examples from Sweerts’ own collection but on those of the French king Henri IV’s garden in Paris as drawn by Pierre Vallet and then used in de Bry’s Florilegium. In other words the images of the 560 bulbs and other flowers shown were third hand, but because they were so decorative Sweert’s Florilegium ran to 6 editions between 1612 and 1647. It’s difficult to know whether Furber would have known about Sweert’s way of presenting plants for sale, and certainly the same process of having high quality, almost standalone, images does not happen in England until much later. 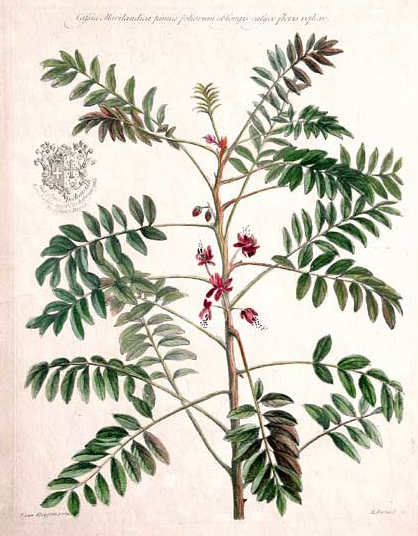 Senna marilandica – from Historia plantarum rariorum by John Martyn. However he would have known about John Martyn’s Historia Plantarum Rariorum published in 1728. In this the text was accompanied by 50 colour printed mezzotints copied from paintings by Jacob Van Huysum, which again could easily have been free-standing decorative prints. It was this model that was adopted by Furber. He chose not to have images accompanying the text of a plant list but instead to use the images themselves to sell his plants. Furber also innovated in another way. Instead of him commissioning an artist and an engraver to produce the images for him it seems he went into a sort of partnership and produced the images with them.. Using the plants from Furber’s nursery, Peter Casteels, a Flemish-born artist who had moved to London permenently, painted a series of 12 decorative images. Each featured a large urn or vase full of the flowers that were at their seasonal best for each month of the year. This of course, included plants from the greenhouse. These paintings were then turned into beautifully engravings by Henry Fletcher, who had previously worked on the Catalogus Plantorum. This was not only an innovatory way of selling plants it was an extremely expensive one. The three put in a total of £500 to the venture. To recoup their costs they turned to the funding method used by many authors of the time, sale by subscription. In this they were eminently successful. 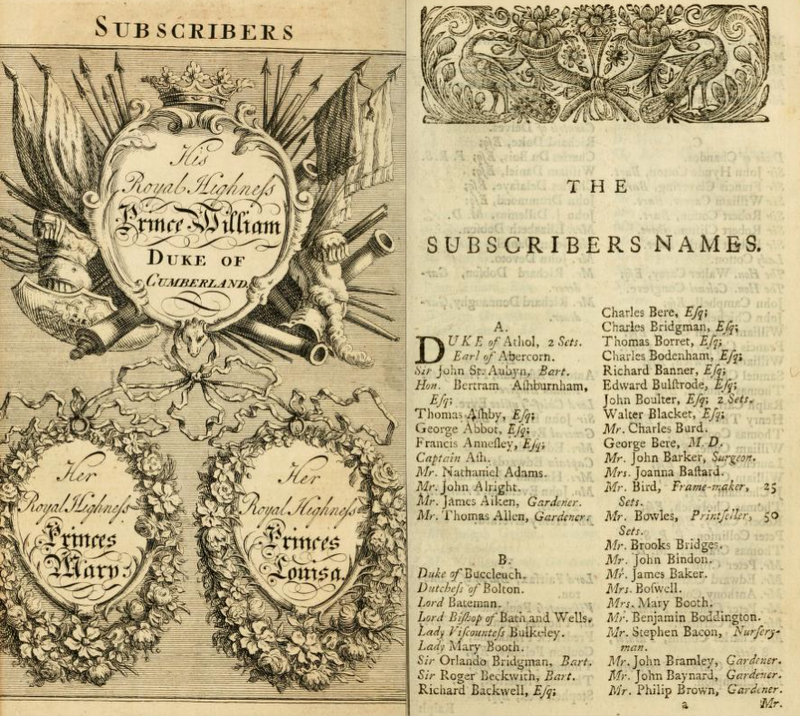 The 457 strong subscribers list, headed by Frederick, Prince of Wales, is a veritable who’s who for 1730 and in 1732, to reinforce their appeal to the elite, an additional plate was issued listing their names within a decorative floral surround mainly of auriculas, anemones, and tulips. Sets were sold on subscription for 2 guineas making the three a profit of £460. In addition, once the run had been completed sets were sold to non-subscribers for 2½ guineas coloured or 25s as black and white engravings. Each plate came with a key. 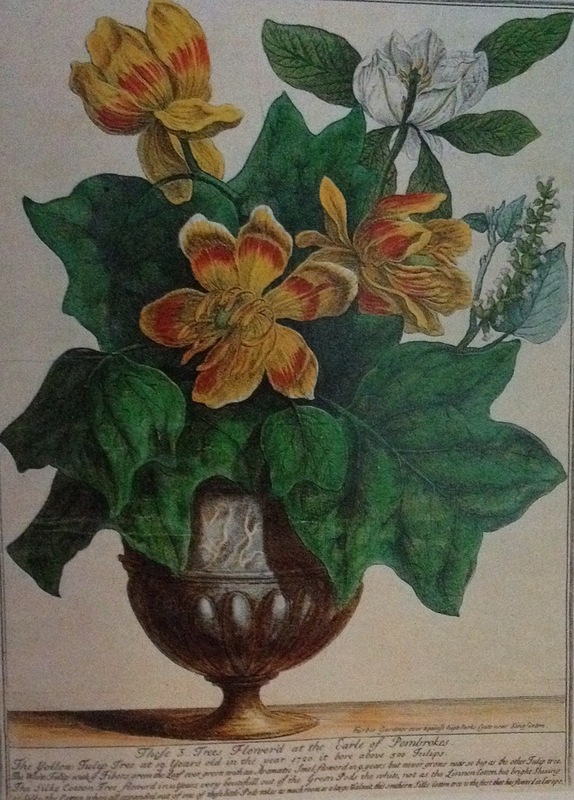 All the flowers in the image were numbered discretely, and then listed at the bottom of the page. In all there were over 400 species depicted, including 25 from plants sent to Furber by Mark Catesby who was plant hunting in the Carolinas. 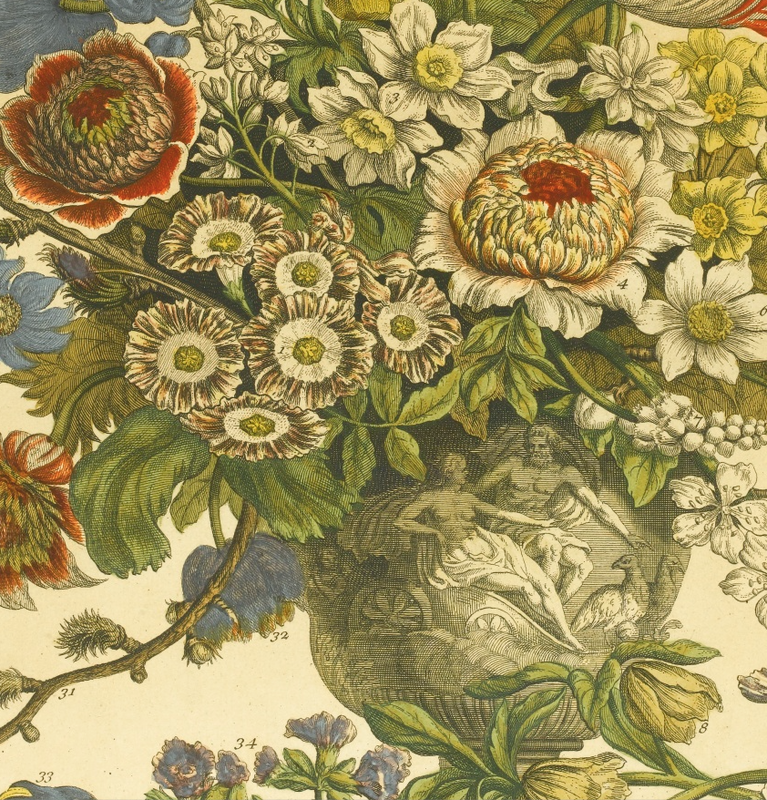 Furber’s Flowers was an instant artistic success – and paid off commercially too. Athough we don’t know exactly the impact on his plant sales we do know that Furber landed valuable contracts such as one at Carlton House for the Prince of Wales in 1734. This was mainly for new American trees sent over by Mark Catesby to Furber, and which included a single tulip tree costing £21. What is very clear, however, is that the prints themselves took on a life of their own, completely separate from any role they might once have played as a stock list. No sooner was the issue complete than plagiarists started work copying it. 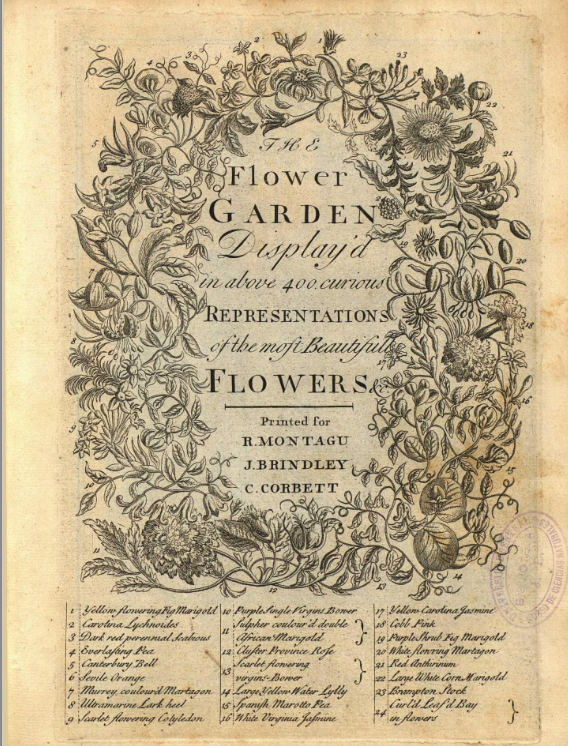 In 1732 another edition appeared in an anonymous quarto-sized book format as The Flower Garden Display’d. The plates had been re-engraved on a smaller scale “from the Designs of Mr Furber” and were much cruder as can be seen be the January plate below. 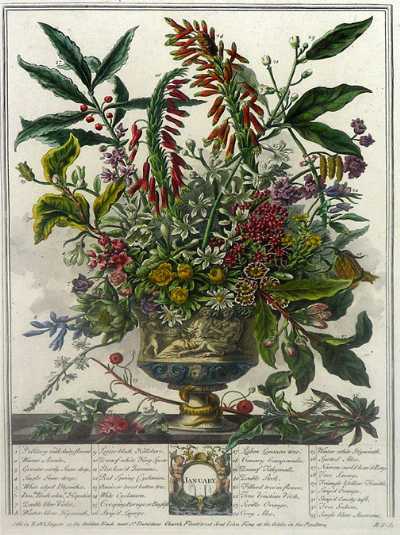 The plates were accompanied by extensive cultivation advice, which as Blanche Henrey shows in British Botanical and Horticultural Literature before 1800, was almost certainly the work of Richard Bradley, one-time professor of Botany at Cambridge. A second edition appeared just two years later, with the addition of a little treatise on indoor plants by Thomas Moore. After the two versions already mentioned, further copies of the plates reappeared [although sometimes in reverse!] 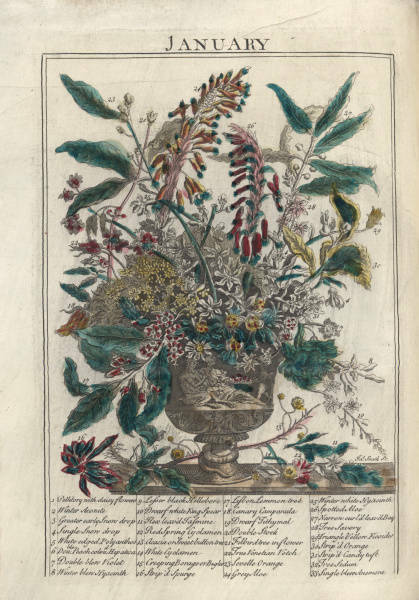 in a version called Flora: a curious collection of flowers issued by the leading print-seller and publisher John Bowles in the late 1740s. Bowles’s plates were then reused again – with his name erased and a new ‘publisher’s name inserted, along with one or two insects added to some of the plates! In all its thought at least 6 publishers were offering prints based on the plates during the 1740s and 1750s. However these were produced without the agreement of the three partners, and obviously to their financial loss. Indeed Henry Fletcher gave evidence in the parliamentary proceedings that led to the establishment of the engraver’s copyright act (sometime known as ‘Hogarth’s Act’) in 1735. 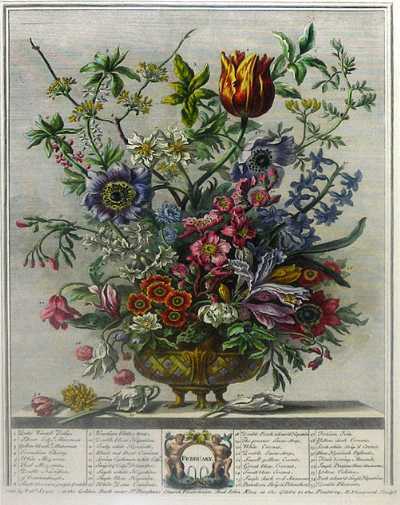 Building on the success of the Twelve Months of Flowers, Furber now worked with Casteels to produce a series of fruit paintings, and then Fletcher to engrave them. 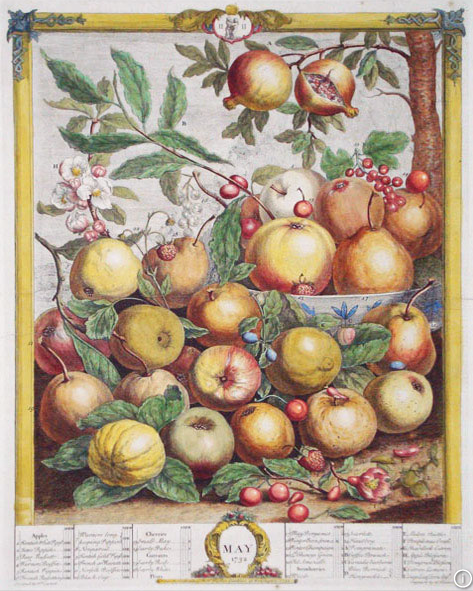 They were issued in 1732 as Twelve Months of Fruit, featuring twelve full-colour plates with a total of 364 different fruit, each numbered and identified. Every image has a different arrangement, with the fruit displayed on plates, bowls or baskets. 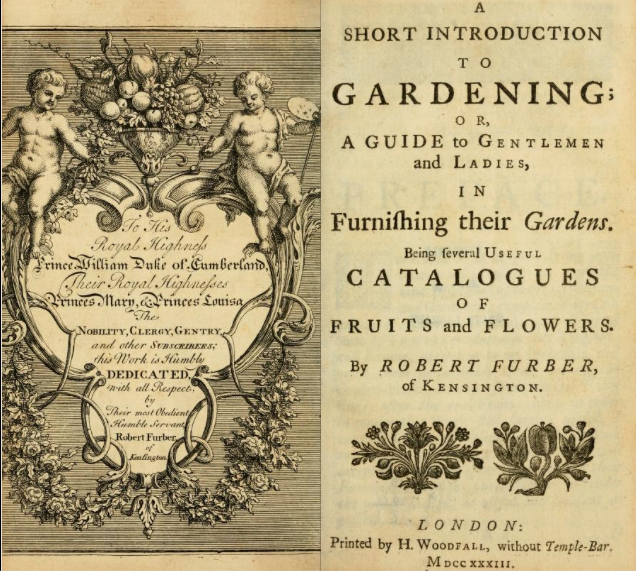 Subscribers were given a free gift as a mark of gratitude from Furber: his A Short Introduction to Gardening: or, a guide to gentlemen and ladies, in furnishing their gardens, which listed the subscribers and details about the plants in ‘several Useful Catalogues of Fruits and Flowers’. This was he said to help his customers ‘in furnishing their Gardens and their Tables’. 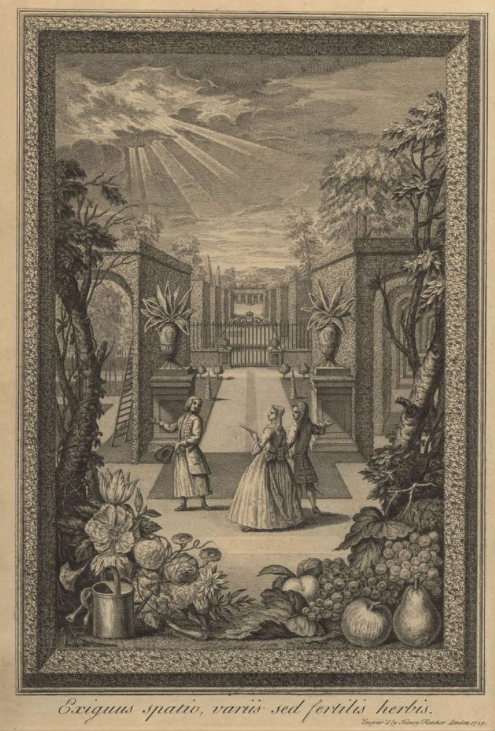 It is interesting to note that although subscribers are largely from the elite, there are a considerable number of gardeners, nurserymen and seedsmen, but also of those interested in the prints as decorative objects such as printsellers, painters, engravers and framemakers. After that Furber seems to have given up elaborate publishing ventures and gone back to selling plants. He had become an overseer of the poor in the parish of St Mary Abbots, Kensington, in 1718, and a churchwarden in 1725–6 and again in 1736–7. Little is heard of him after that until his death in 1756. He is buried at St Mary Abbots on 1 September 1756. His wife inherited their home, but his nursery business was left to John Williamson, who worked with him during his later years. It remained in operation until the late 1840s. But though the nursery may have gone Furber’s name lives on through his beautiful catalogues which are highly sought after and much copied. 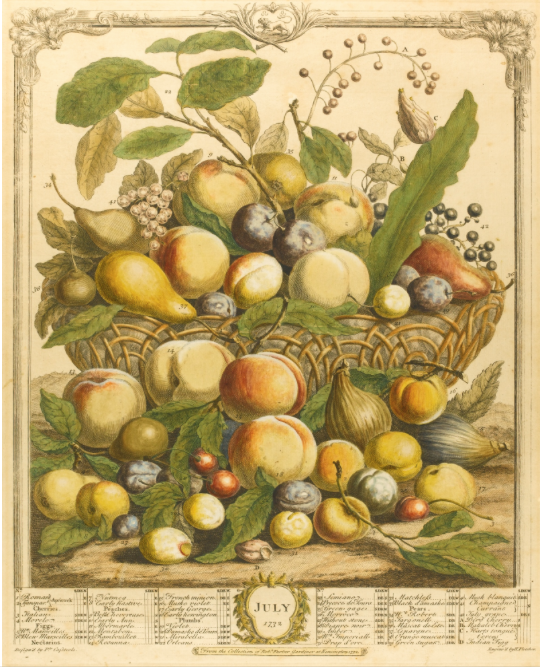 This entry was posted in Uncategorized and tagged fruit, Fulham Palace, Henry Compton, Mark Catesby, nurserymen, Philip Miller. Bookmark the permalink. Thanks. A very interesting read. 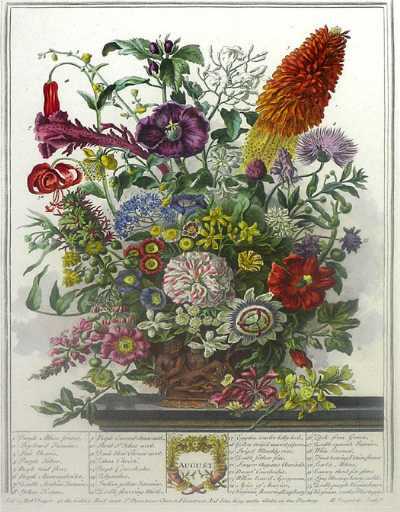 So did Robert Furber only produce one run of his Twelve Months of Flowers? Or did he produce many etching prints over the years from these original etchings?